Another year of Winter Bike To Work Day has arrived and, as on every February 8, Canadians across the country are braving chilly conditions to commit to their cycle commute. From deep cold in Edmoton to ice and slush in parts of Ontario, riders met up to revel in the frigid fun. In Calgary, where Winter Cycle Congress 2019 was set to wrap up, local shop Bike Bike teamed up with a brave coffee brewer to bring morning commuters some much needed caffeine via a loaded up cargo bike and mobile brewing set-up. With the WCCC2019 on in the city, one Arizona rider had his first ever winter cycle to mark Winter Bike To Work Day. Furhter west, even usually-balmy Victoria, B.C. got in the spirit of the occasion. February cycle commuters are a common sight in the left-most provincial capital. Snow is not. 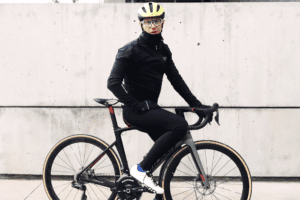 Winter made a surprise appearance, with riders braving wet flurries – and Victoria drivers, to make it to the office by bike.